Last month, I attended the Swedish-American Chamber of Commerce of New York’s (SACC New York) annual sustainability summit. In its 10th year, this year’s theme was “Mad About Food.” The presenters in this fast-paced event were progressive thinkers from business, academia, and technology. Many were from Sweden, of course, and I learned some of the reasons why “Swedishness” and sustainability go hand and hand, and what Americans can learn. This year, Sweden signed a law that requires the country to reach net-zero emissions by the year 2045. They went beyond what they pledged under the Paris Climate Change Agreement in 2015, setting their target date 5 years earlier than originally planned. Nina Ekelund of The Haga Institute shared some of the impacts of Sweden’s earlier commitments. After the Paris Agreement, the portion of companies measuring their climate impact increased from 1 out of 4 from 3 out of 4– without any regulations. Their approach – including a high carbon tax – has been good for business. Since 1990, there was a 25% reduction in emissions alongside a 69% increase in GDP. At Space10, an Innovation Center in Sweden, Guillaume Charny-Brunet’s team was considering the development of shower technology that managed water flow and use. The switched gears when they thought about what would save the most water: reducing meat consumption. The water required for 1 beef burger is the equivalent of 1.5 months in the shower. So they started experimenting with alternative agriculture, and set up an aquaponics system that grew enough vegetables for a building. The vision is to go well beyond that. Michael La Cour, Managing Director of IKEA Food Services explained IKEA Food’s mission: Honest food for people and the planet. What do they see as the most important KPI? They serve 650 million people a year. They have 194,000 coworkers throughout the world, and counting, which gives them great opportunity and great responsibility. The winner of SACC New York-Deloitte Green award was Sweden-based Whywaste: “Reduce food waste through data driven workflows.” Whywaste currently focuses on supermarkets in Sweden, using data to keep better attention to expiration date and control purchasing decisions. Like my employer, LeanPath, they empower employees to keep food waste at a minimum through knowledge. “Swedes are change-minded to the absurd.” Johan Jörgensen, founder of Sweden FoodTech. They run after new tech, Johan says, which is one of the reasons why he sees Sweden as leading sustainability efforts in food. One of the trending concepts is the idea of individualized nutrition. Professor Robert Brummer from Orebro University explained the gut-brain interaction. He presented the idea that we need to be more proactive about designing for a healthy life versus reactive to problems — he called it a shift from an illness paradigm to a wellness paradigm. Following that was a presentation by Eatit, a Swedish company that acts as digital doctor, dietician and chef by using a blood test and artificial intelligence to provide individualized food recommendations for improving health. People are always looking for help making the best decisions when it comes to health and waste. I learned about Tellspec, a spectroscopy-based food sensor that aims to solve food fraud, food adulteration, food safety, and food waste, by taking some of the subjectivity out and looking at the chemical structure of food, an intriguing idea. This summit reminded me that we can’t predict where technology is going, and there may be capabilities far beyond what we can imagine. In my afternoon workshop, Nina Ekelund gave the example of smart phones. How many of us could have known the capacity of these portable computing devices? I believe more of us in the US-based sustainability community can take a page out of Sweden’s book and keep an open mind about the options we have to tackle food waste. Have you heard of aquafaba, the water waste product of cooking dried beans? You’ll find it as the liquid in your can of chickpeas, or create it when boiling your own dried beans at home. I was recently introduced to aquafaba and its culinary potential firsthand at the Food Loves Tech conference exhibition in Manhattan. It turns out, aquafaba as an ingredient behaves similarly to eggs or egg whites, making it a big deal among vegan cooks. I tasted Sir Kensington’s delicious vegan mayo made from aquafaba, aka “fabanaise.” They sourced the liquid from a hummus producer that had it in abundance and was otherwise wasting it. These are the types of business partnerships we need more of! The story of how I came to be sharing this recipe with you today is that, on what turned out to be my one “vacation” day of maternity leave before the baby, I cooked dried chickpeas. I cooked them in my brand new pressure cooker, so it was an adventure. (The pressure cooker was actually a baby shower gift from my friend @LadyParmalade. Months before, she had been telling me about the pleasures of a pressure cooker, and I jokingly asked if it would be appropriate to register for a kitchen item like that. It was not intended as a hint, but she ran with it!) I’m sure I’ll post more about pressure cooker experiences in the future. In this case, the chickpeas were a huge success, and I saved the liquid because it was actually darn tasty. Fast forward to days later, after I was home from the hospital with a newborn. I usually don’t like to post back-to-back recipes in a similar genre (dessert), but I was incredibly blessed to have all my main meals provided to or cooked for me for the week and half following the birth. My mother stayed with us and cooked one colorful and nutritious meal after another. She and my dad even insisted on doing all the dishes! It gave me the freedom to use my unexplainable burst of energy one afternoon to bake up a dessert, with my chickpea water. Now, you might think that these brownies are a little “out there” and can’t fulfill a craving for real brownies. I urge you to keep an open mind. The texture emulates some of the fudgiest non-vegan brownies I’ve had, and while you may notice hints of unusual flavors, the dominant taste is rich chocolate. With vanilla ice cream, you can hardly tell a difference! Set your oven to preheat to 350 degrees F. Grease an 8 inch square baking pan and set aside. Melt 3 ounces of the chocolate chips and 1/4 Cup coconut oil in a medium saucepan set over medium-low heat. Remove from heat and add brown sugar, maple syrup and pinch of salt. Whisk together, and then add aquafaba. Add vanilla, cinnamon, espresso powder, and flour, and mix well. Incorporate remaining 4.5 ounces of chocolate chips. Pour batter into the baking pan. Bake for approximately 35 minutes. Take care not to over-bake; these brownies should be moist. Allow to cool. (Expect some suffering from the intoxicating chocolate smell). Cut and serve. Vanilla ice cream or whipped cream optional. What does one do at 39 weeks pregnant, during a heat wave, after accepting an invitation to visit friends who are barbecuing food, and after agreeing to bring dessert? How about baking something that requires having the oven on for about an hour? And not only that, but why not try halving the recipe so that it is the same amount of work but half the delicious output? Oh, just me? Perhaps I wasn’t thinking clearly. Let me explain. I was trying to come up with a refreshing dessert other than frozen treats, which I fully intended to incorporate in the day anyway, and lemon came to mind. I knew I had a lemon that needed to be used soon. And then when leafing through my saved magazine recipes, I found this recipe for lemon cheesecake bars made with cream cheese–and I knew I had cream cheese! But that was a leftover from another recipe- I only had half of the full block the recipe called for. So I adapted. And we savored the fewer servings that resulted. My cooking activities aren’t about making specific or required amounts of food anyway. I’ve been finding the activity of cooking and baking wonderfully distracting lately as I carry around an extra human being. In fact, I’m considering what I might cook when I start early labor…. I am sharing with you my version with the recipe cut in half, but I expect you may want to make a full batch. Another reason why it’s not that big of a deal that I was making only half the recipe: it’s the type of recipe that allows me to incorporate a number of my favorite shortcuts and conveniences, like using the food processor for crusts and blending and measuring with a kitchen scale. As I alluded to in the introduction, however, be prepared for the multi-part process of pre-baking the crust, baking the filling, and allowing for chill time. No instant gratification with this one. Prepare the crust: Cut butter into small pieces and place in freezer to thoroughly chill. Measure and add flour, almonds, powdered sugar, oil, and salt to a food processor. Process until almonds are ground into small pieces. Add butter to food processor; mix in pulses until the texture resembles a coarse meal. Spray small-medium glass baking dish with cooking spray (I calculated that my 8×8 glass storage container had a bit less than half the area of the 11×17 dish the original recipe called for) and add crust mixture. Pat down gently into an even layer. Bake for about 23 minutes, until slightly browned. Allow to cool. Clean out the food processor. Add all the ingredients except for the egg and process until smooth. Add egg and blend together. Pour mixture evenly over crust. Place in 325°F oven for 30 minutes or until set. (check at 20 minutes, especially if your dish is larger so that your filling is spread more shallowly). Cool completely on a rack or stovetop grate. Cover and refrigerate until chilled. If desired (like in my case), accelerate the chilling with an ice water bath or some time in the freezer. Cut into [small] pieces with a sharp knife and serve. Feel free to follow my example and serve on winter-themed plates, if that will help you to feel cooler (those are snowshoes peeking out from under the bar). Have you heard about the crusade against K-Cups? In the unlikely case you need a refresher, “K-Cups” is the abbreviated term for those little vacuum sealed pods of ground coffee used with a Keurig machine to produce a single serving of coffee with the push of a button and less than a minute. A few years ago, Keurig machines were the it product, the must-buy at holidays or for weddings or housewarming. The crusade itself is even old news now. Way back toward the beginning of 2015, one of the founders declared his regrets for inventing a product that in a single year (2014), produced enough waste to circle the globe more than 10 times. The Internet rallied. First of all, what a novel thought, that there exists an entrepreneur who thinks about more than his net worth, who admitted he wished he did something differently. Secondly, how could he have been so thoughtless? We, millions of followers, succumbed to the promotions and temptations of technology and then were FORCED to buy billions of pods that could not be recycled. What a calamity! Oh have we learned our lesson. The reactions I came across were fairly unanimous in their abject hate toward K-Cups. There was little controversy over the suggestion to eliminate K-Cups from your diet for the betterment of the world and your taste buds. I stood by, a little irked. Why such consensus about K-cups? Couldn’t we all unite over something more significant? I was reluctant to take another side in the crusade, until now. A little more recently, I read a Thrillist post shaming K-Cup users that was so terribly done it made me angry. Now I will have my piece. No, I won’t heap praise on the product, but I would like to point out why this topic seems overblown. 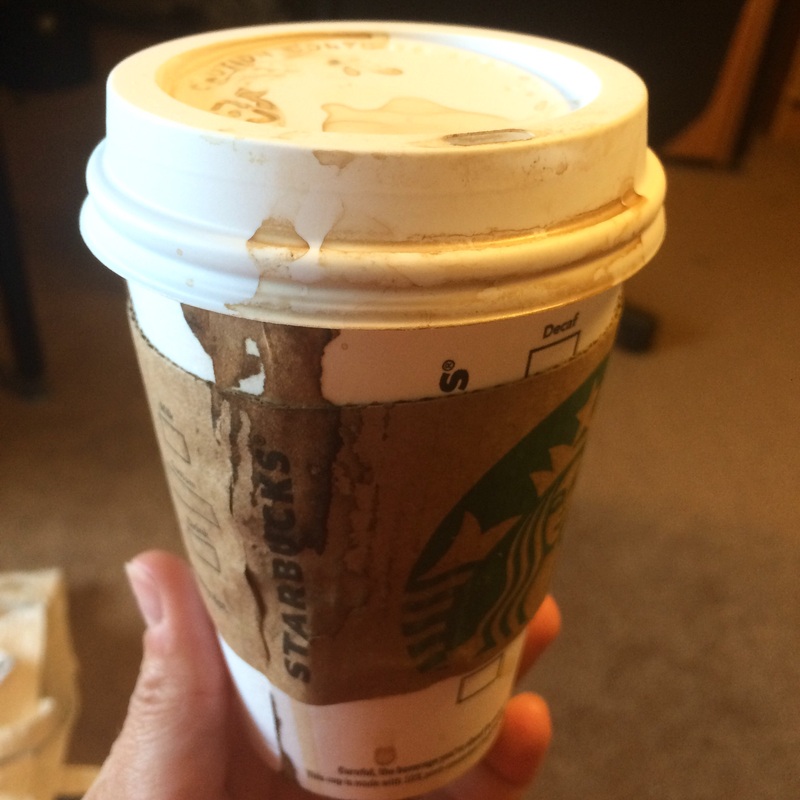 Don’t even get me started about how ineffective Starbucks cup lids are against leaks. wouldn’t otherwise. However, in some of those places, before the machine arrived, do you know what those regular drinkers would do? They would go elsewhere, purchase a brewed cup that came in a paper or styrofoam cup with a plastic lid, bring it back to their office, and then toss it in the bags headed for a landfill. How many times around the world would those go? In one of my recent jobs, we placed a Keurig machine on top of a tiny table next to a tiny fridge in the hallway outside our various shared offices. Now, you might say (or as Thrillist is pretentiously exhorting), put a coffee maker there and use fresh grounds! I say, are you kidding? What a mess. Do you know how rarely this area was cleaned? To get to the closest sink, you had to walk down the hall, through one set of doors, across an atrium and through another door…and that was for a bathroom sink. Washing a pot and filter and any other components was unlikely to happen. Let’s acknowledge that since many of us require caffeine to function effectively, coffee is probably here to stay for awhile. If you clicked on the Thrillist link, you’ll see that the #1 listed reason to quit K-Cups is “You shouldn’t make coffee like a monkey.” Really, this is your argument? “Our ability to use complex tools is what separates us from other primates.” I guess the author is a fan of those fancy corporate espresso machines that are so complex that they can impossible to figure out. My thought is if K-Cups provide a quick source of caffeine to get someone’s brain functioning in order to use other complex tools to solve critical world problems, then it’s OK that they didn’t have to use much of their brain to make that cup! What frustrates me the most is that the Atlantic interview that got everyone riled up was actually somewhat balanced. The reporter pointed out significant facts about how other home coffee machines use more electricity, brew inefficiently and result in plenty of wasted water [update: I came across a study that was externally-reviewed (yet, of course, commissioned by a biased source) that found single-serve coffee capsules have a lower overall environmental impact)], how non-renewable resources are used to transport coffee to places like Starbucks and for the customers to drive themselves there, and how coffee itself is a water-intensive crop. “Thinking about all of this has been almost enough to make me feel like every coffee method is so far from perfect that I should just give up entirely,” Hamblin said. When other media outlets picked up the story, did they include these facts? Not so much. Not Business Insider, not CNN, not The Washington Post, to name a few. It goes to show, take any news story about your grains of coffee with a grain of salt.